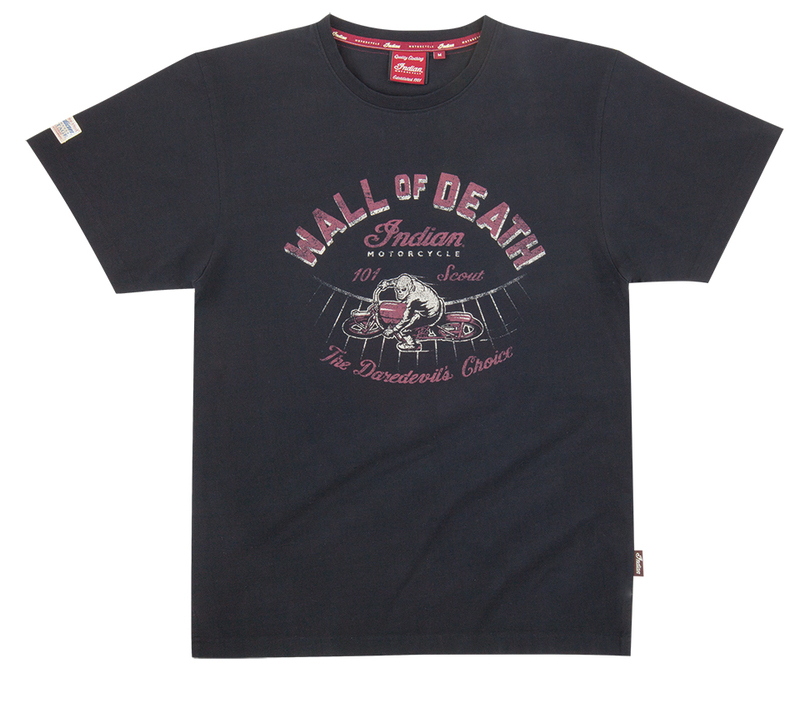 Celebrate the daredevil exploits of the legendary Wall of Death riders with this great looking tee. It features contrast-colour shoulder stitching and a multi-colour Wall of Death graphic on the front with the words ‘The Daredevil’s Choice’. Indian Scout riders and enthusiasts who admire this high-performance model will enjoy this comfortable, all-cotton red tee with bold Indian Scout branding across the front. 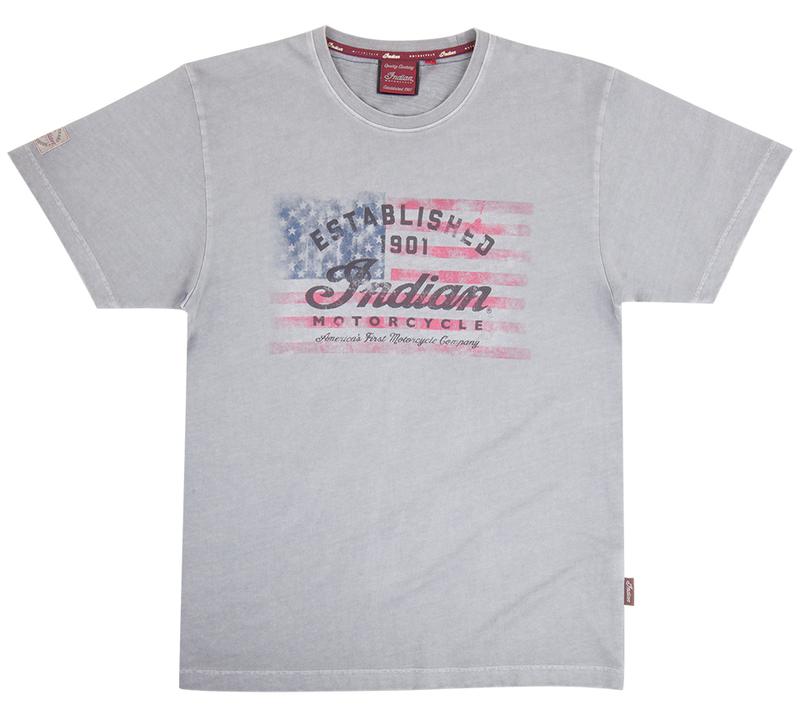 Celebrate the fact that Indian Motorcycle truly is America’s First Motorcycle Company with this soft, comfortable 1901 Flag Tee. This shirt features premium construction such as heavy duty stitching, a branded side seam tab, with multiple branding tags and graphics. 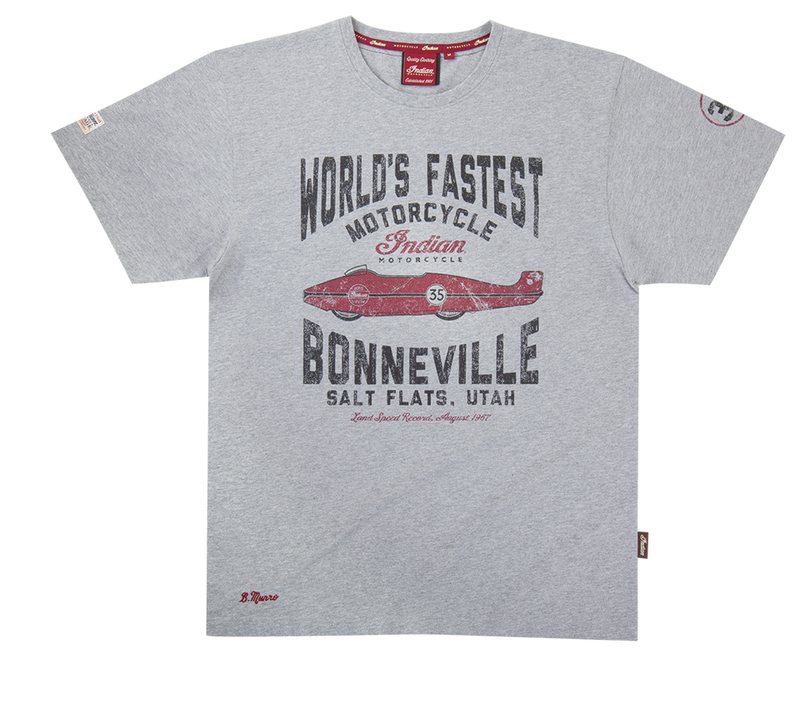 The quality, construction and finish of this Munro World’s Fastest Tee are modern and first-rate, while the vintage graphics on the front look like they’re straight out of 1967, when Burt set his land speed record. There are also graphics on the back, and Burt’s bike number, 35, on the left sleeve. Has a distressed front logo and the name of the original Indian Motorcycle company on the back. This Pale Blue Logo Tee features a feminine V-neck and distressed-print Indian Motorcycle branding across the front. This two-toned tee is relaxed and comfortable, perfect for wearing any day. The contrasting red raglan sleeves and distressed-print Indian Motorcycle branding across the front rev up the style even more. This tee showcases a flattering neckline and unique lace-up panel running up the back for added flair. Across the front is special Indian Motorcycle branding featuring a distressed stars & stripes graphic of the United States. It’s the perfect graphic befitting America’s first motorcycle. 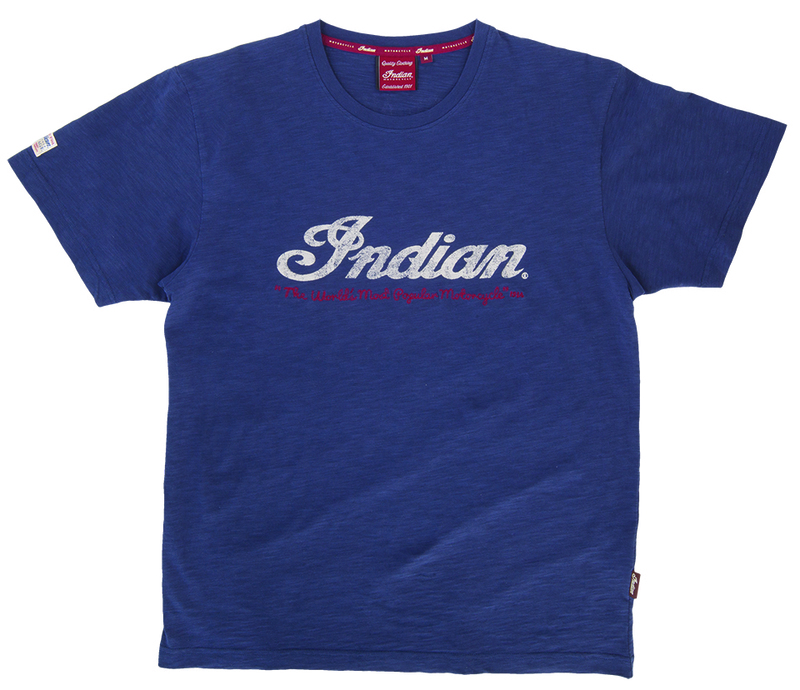 This tee delivers the winning combination of style and comfort with a distressed graphic celebrating that Indian Motorcycle is America’s first motorcycle brand. A wider neckline adds a nice feminine touch to this relaxed tee. 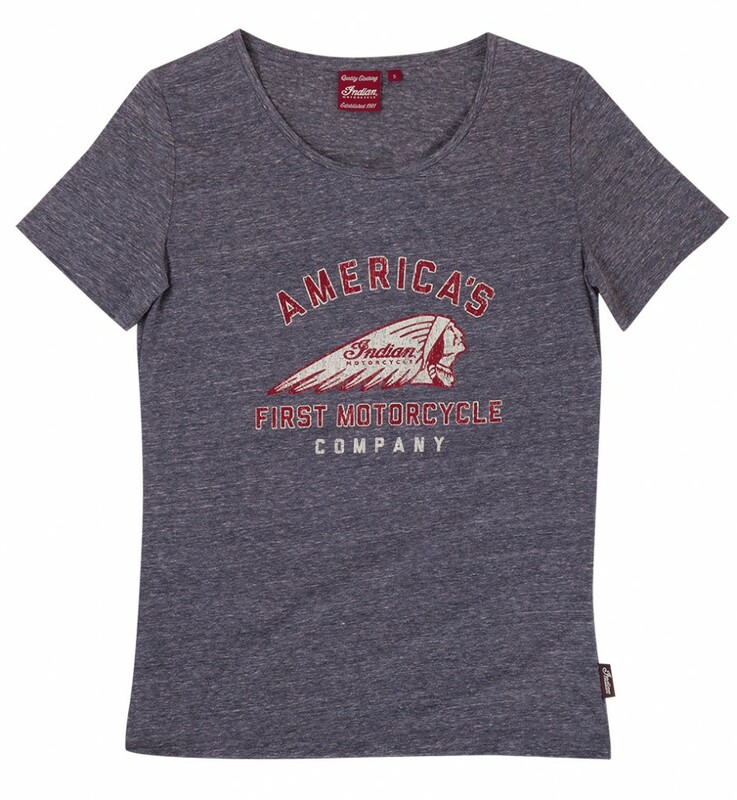 This has a flattering and relaxed cut with the comfort of all-cotton construction and distressed Indian Motorcycle branding across the front.